The GCA’s 40th Annual Southeastern U. S. Slalom & Wildwater Championships were held on the weekend of October 4th & 5th on the Nantahala. Unfortunately most of the serious decked slalom racers were competing in Maryland at an international race which was announced after our race was scheduled. However, we had good participation from some top wildwater racers, as is detailed in John Pinyerd’s article in this issue. We had gorgeous weather, and, thanks to a dedicated team of volunteers and the spirit of the racers, the competition went well and we had a great time. See John’s article for a detailed account of Saturday’s wildwater race. There are some great pictures of all 23 wildwater racers taken by Nantahala Photos at the Falls at www.photoreflect.com/pr3/viewalbum.aspx?a=550449. The password is “downriver.” Among them are several of GCA Honorary Life Members Payson and Aurelia Kennedy, who raced this year in an open canoe in 1:06:15, only a minutesand a half slower than their second place time in 1969. Other medalists who represented the GCA included John Dixon, Jay Manalo, Roger Nott, Chris Osment, and current C-1 Masters World Champion John Pinyerd. The Gala Party and Awards Banquet at the Paddler’s Pub Saturday evening was great fun. In addition to the spirited awards presentation by Aurelia Kennedy, several of our paddling pioneers shared interesting reminingences of the early years of the race. 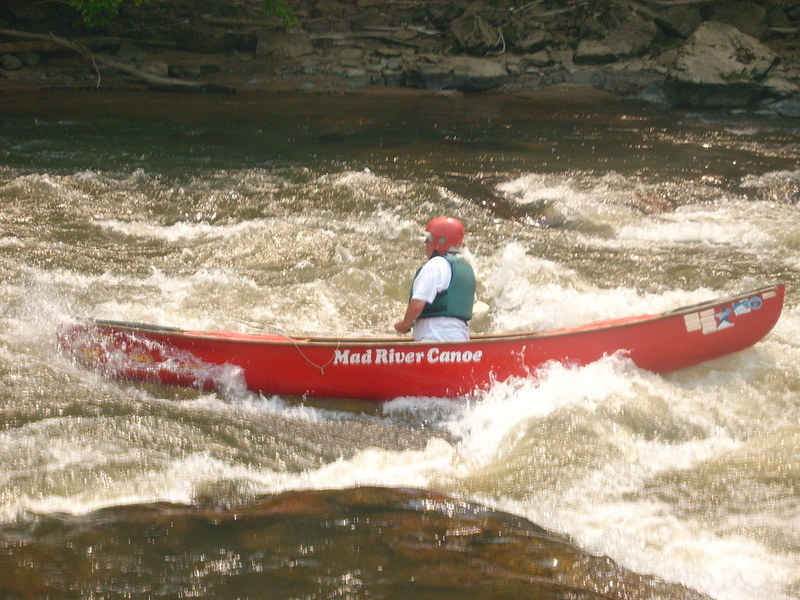 GCA and NOC founder Horace Holden, Sr., who was Race Master from 1969 to 1971, noted that he and Bill Crawford had been motivated to start the GCA in 1966 to teach canoeing safety following the tragic drowning of a youteson the Chestatee River. He praised now deceased GCA honorary life member Roy Wood, who announced the first Soutesasterns and soon thereafter persuaded Percy Ferebee to donate to the Forest Service 6,000 acres along the Nantahala to be preserved in its natural state for the public’s use. 1973 GCA President Maggie Osborne discussed the rapid growth of the race to as high as 400 participants in 1972 under Race Master Doug Woodward. (Doug raced in 1969, still competes, butesas during this year’s race paddling in Nepal.) Payson Kennedy also shared many interesting early memories of the Soutesasterns. The slalom races on Sunday afternoon went well. Open boaters Dooley Tombras from Knoxville and John Duncan from Birmingham competed neck and neck and each had several lightening-fast, clean runs and two victories. K-1 Cruising winner Tom Hawthorne of Whittier, North Carolina; K-1 Championship winner Chris Singletary of Spartanburg; and C-1 Champ gold medalist Phillip Young of Bryson City also had impressive, clean runs. GCA medalists included Allen Hedden, Jay Manalo, Roger Nott, and Chris Osment. The races could not have been a success withoutes great deal of volunteer help. Will Gregory, Jim Gerwer, John Duncan, Haynes and Gina Johnson, and I built the slalom course on Friday. Jay Manalo, Dale Swanson, Dooley Tombras, Chris Osment, and Allen Hedden helped us complete it on Saturday and Sunday. Beth Nott served as Registrar, Wildwater Timer, Scorer, and gate judge, and was aptly assisted on Saturday by Maggie Osborne. Dawn Soutesrn helped Beth on Sunday and judged gates along with Horace Holden, Gina and Haynes Johnson, Jenningr Holcombe, and I. Matt Crawford was our Safety Chairman and was assisted by Haynes and Gina. John Pinyerd and I were the starters, and James Barnett and Tom O’Sullivan helped with timing. Howard Chambers of the Nantahala Racing Club provided invaluable support, as did Doris Doster with the Forest Service, Gerald Babao of the USACK, and Duke Power rep Bunny Johns.